Scientists announced today that they have used NASA's Chandra X-ray Observatory to confirm that a gamma-ray burst was connected to the death of a massive star. This result is an important step in understanding the origin of gamma-ray bursts, the most violent events in the present-day Universe. 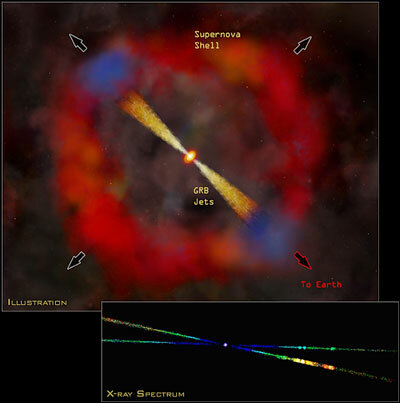 A 21-hour Chandra observation of the afterglow of the gamma-ray burst GRB 020813 revealed an overabundance of elements characteristically ejected by the supernova explosion of a massive star. The afterglow is thought to be produced by the interaction of a jet of high energy particles with the expanding supernova shell. Credit: Illustration: CXC/M.Weiss; Spectrum: NASA/CXC/N.Butler et al. "If a gamma-ray burst were a crime, then we now have strong circumstantial evidence that a supernova explosion was at the scene," said Nathaniel Butler of Massachusetts Institute of Technology in Cambridge, lead author of a paper presented today at the meeting of the High Energy Division of the American Astronomical Society. Chandra was able to obtain an unusually long observation (approximately 21 hours) of the afterglow of GRB 020813 (so named because the High-Energy Transient Explorer, HETE, discovered it on August 13, 2002.) A grating spectrometer aboard Chandra revealed an overabundance of elements characteristically dispersed in a supernova explosion. Narrow lines, or bumps, due to silicon and sulfur ions (atoms stripped of most of their electrons) were clearly identified in the X-ray spectrum of GRB 020813. "Our observation of GRB 020813 supports two of the most important features of the popular supra-nova model for gamma-ray bursts," said Butler. "An extremely massive star likely exploded less than two months prior to the gamma-ray burst, and the radiation from the gamma-ray burst was beamed into a narrow cone." An analysis of the data showed that the ions were moving away from the site of the gamma-ray burst at a tenth the speed of light, probably as part of a shell of matter ejected in the supernova explosion. The line features were observed to be sharply peaked, indicating that they were coming from a narrow region of the expanding shell. This implies that only a small fraction of the shell was illuminated by the gamma-ray burst, as would be expected if the burst was beamed into a narrow cone. The observed duration of the afterglow suggests a delay of about 60 days between the supernova and the gamma ray burst. The supra-nova model involves a two-step process: the first step is the collapse of the core of an extremely massive star accompanied by the ejection of the outer layers of the star. The collapsed core forms a rapidly rotating black hole surrounded by a swirling disk of matter. In the second step this black hole-disk system produces a jet of high-energy particles. Shock waves within the jet produce the burst of X-rays and gamma rays that is observed to last only a few minutes. Interaction of the jet with the ejected supernova shell produces the X-ray afterglow, which can last for days or even months. The reason for the delay between the formation of the black hole and the production of the jet is not understood. Earlier observations with Japan's ASCA, the Italian-Netherlands Beppo-SAX, and the European Space Agency's XMM-Newton satellites, as well as Chandra had given some indication of the presence of elements expected in a shell ejected by a supernova. However, the number of X-rays detected in those observations was small, and the possibility remained that the reported lines were an instrumental effect or statistical fluctuation. Since Chandra was able to observe X-ray lines from GRB 020813 for almost an entire day, the number of X-rays detected was five times larger than for previous observations. This enabled the team to make a definitive identification of the silicon and sulfur lines. Chandra observed GRB 020813 for about 77,000 seconds, approximately 21 hours after the initial burst. Other members of the research team included Herman Marshall, George Ricker, Roland Vanderspeak, Peter Ford, Geoffrey Crew (MIT), and Donald Lamb (University of Chicago). The High Energy Transmission Grating Spectrometer was built by MIT. NASA's Marshall Space Flight Center in Huntsville, Ala., manages the Chandra program, and TRW, Inc., Redondo Beach, Calif., is the prime contractor for the spacecraft. The Smithsonian's Chandra X-ray Center controls science and flight operations from Cambridge, Mass., for the Office of Space Science at NASA Headquarters, Washington.